Crazy Wear pants are famous for their baggy thigh and tapered ankle. You'll find their workout pants and tank tops for men in this gym clothes store. Spelling variations of California Crazee Wear and Crazy Wear help people find the gym pants maker. A perfect muscle top from Crazee Wear bodybuilding clothes. 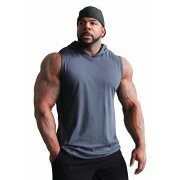 This 3/4 sleeve bodybuilder top is made from 50/50 cotton/poly jersey fabric. The loose, but tapered fit of this bodybuilding shirt is cut for a well-proportioned build. 3 muscle top colors. ..
A mens racerback tank top with a T-back cut from Crazy Wear workout clothes. Made from 50/50 cotton/poly fabric with the Crazee Wear name patch stitched to the lower edge of the workout tanktop. This racerback tank top is available in three colors. ..
A perfect muscle top from Crazy Wear bodybuilding clothes. 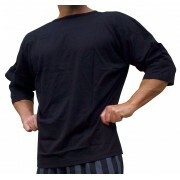 This 3/4 sleeve bodybuilder top is made from 50/50 cotton/poly jersey fabric. The loose, but tapered fit of this bodybuilding shirt is cut for a well-proportioned build. 3 muscle top colors. .. Workout pants from California Crazy Wear. 50/50 cotton/poly, baggy thighs, tapered ankles, "2.5 elastic waistband, side pockets. 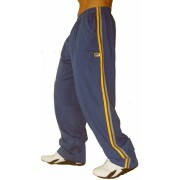 This is the California Crazee Wear workout pants patterns listing. See other for black California Crazee Wear pants. .. Workout pants from Crazy Wear are baggy in the upper thigh, tapered ankles, side pockets, "2.5 elastic waistband. Crazee Wear pants are 50/50 cotton/poly fabric. 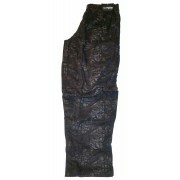 See other listing for Crazy Wear workout pants in patterns. Add: 2XL +$2, 3XL +$4 .. 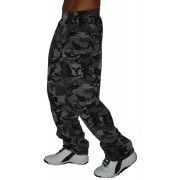 The California Crazee Wear workout pant in the MPPJ style. Double stripe runs the full length of the workout pant. Side pocket, drawstring 1.5" elastic waistband. The 50/50 cotton/poly jersey Crazy Wear workout pant taper less. 2XL +$2, 3XL +$4 ..